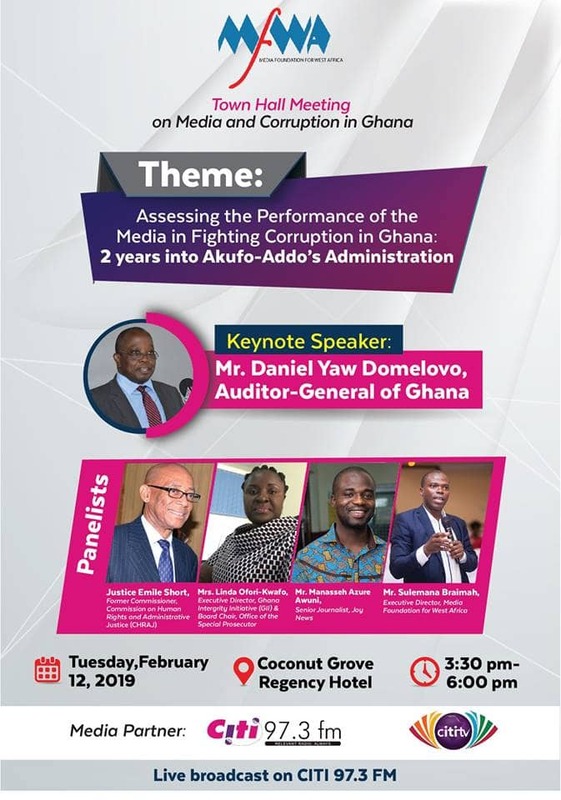 The Foundation for West Africa (MFWA) in partnership with Citi FM will host the Auditor-General of Ghana, Daniel Yaw Domelevo, at a town hall meeting on media and corruption today, Tuesday, February 12, 2019. The event will be held at 3:30 pm at the Coconut Grove Regency Hotel in Accra, Ghana. The town hall meeting will bring together media experts, journalists, civil society organisations (CSOs), government representatives and the diplomatic corps to deliberate on the media’s role in fighting corruption. Mr. Daniel Yaw Domelevo, the Auditor-General of Ghana, will deliver the keynote address at the event while other experts share perspectives on the theme in a panel discussion. The panel will comprise distinguished personalities namely: Justice Emile Short, Former Commissioner, Commission on Human Rights and Administrative Justice (CHRAJ), Linda Ofori Kwafo, Executor Director, Ghana, Ghana Integrity Initiative (GII) & Board Chair, Office of the Special Prosecutor, Manasseh Azure Awuni, Senior Broadcast and Investigative Journalist, Joy FM and Sulemana Braimah, Executive Director, Media Foundation for West Africa. “It is equally essential to assess the performance of the media with regard to its constitutional mandate to hold duty-bearers and public officials accountable,” he added. The meeting will make key recommendations on how the media can effectively sustain the campaign against corruption in the country. The town hall meeting will be live on Citi 97.3 FM. The event forms part of Media Foundation for West Africa’s programme on Media and Good Governance and is organised with support from the William and Flora Hewlett Foundation.